The recent rain has filled it out beautifully and it was so sweet and tasty! 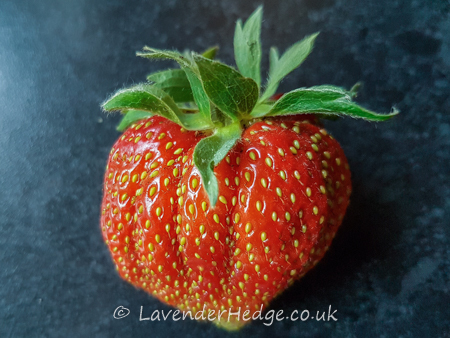 The varieties sold in supermarkets just don’t compare with home-grown strawberries for taste, they sell fruit which is chosen for its ability to transport well, rather than for the taste. They last ones I bought in the supermarket had literally no taste at all. 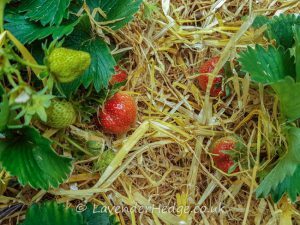 Now that my home-grown strawberries are ripening, it is time to put down straw to protect the fruit and keep it off the ground. I weeded the bed first, removed any dead leaves from the plants, and then put down some chicken manure pellets to boast the plants, since strawberries are very greedy feeders. Carefully lifting any fruit, I placed the straw around each plant and replaced the fruit gently on top of the straw. I had covered the strawberry bed with netting before the fruits ripened, as the birds don’t care whether they are red before they eat them, but if you haven’t done so already, don’t forget to net your strawberries. Hoping you all enjoy your strawberries and if you get a good crop, here is my recipe for strawberry jam.